When you hear a baby squeal with delight, a concert of membranes, bones, and even hairs are working in concert to deliver that sound to your auditory nerve. 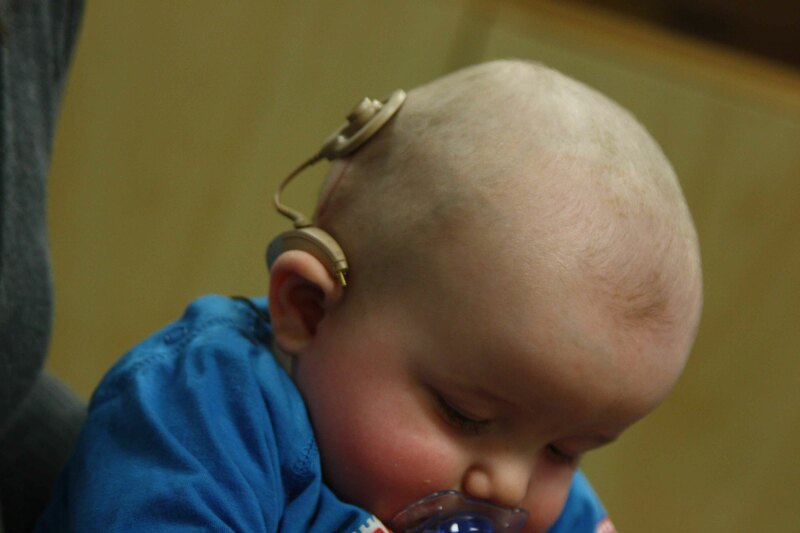 Assessment for proper use of cochlear implants for children can provide for proper delivery of sound. 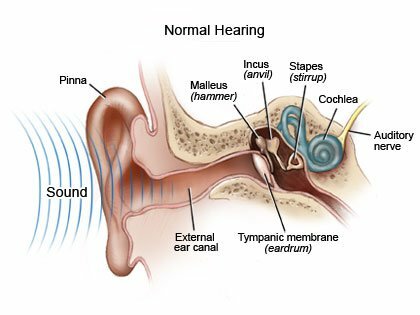 Specifically, sound waves enter your outer ear (pinna), which funnels the sound through the ear canal until it taps the ear drum (tympanic membrane), causing it to vibrate. This stimulates the “hammer, anvil, and stirrup” bones (malleus, incus, and stapes) in your middle ear. The vibration is transmitted into the fluid-filled cochlea, a snail shell-like organ lined with fine hairs. As the fluid is displaced by the vibration, the hairs pick up the disturbance and send it to the auditory nerve, which sends it to your brain, where it is finally interpreted as sound. All in a matter of milliseconds. When something disturbs this chain of events, hearing doesn’t work the way it’s supposed to. Hearing loss often occurs when a person with normal hearing spends too much time listening to sounds that surpass the safe decibel range for human hearing. The sound generated by a jackhammer, a rock concert, or even a crying baby can permanently damage the fine hairs lining the cochlea. A variety of hearing aids can usually correct for any problems in the outer and middle ear, but when the finely-tuned cochlea doesn’t function properly, a cochlear implant is often the only solution. 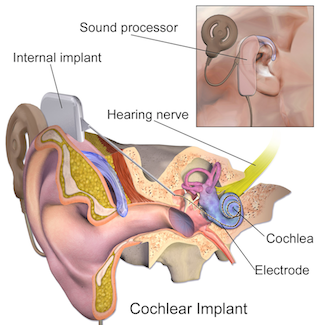 Cochlear implants work by bypassing the cochlea entirely. After receiving vibrational input at the microphone (at the level of the outer ear), the transmitter interprets it and sends an electrical signal to the receiver, or stimulator, which directly stimulates the cochlea with electrical signals that are picked up by the auditory nerve. 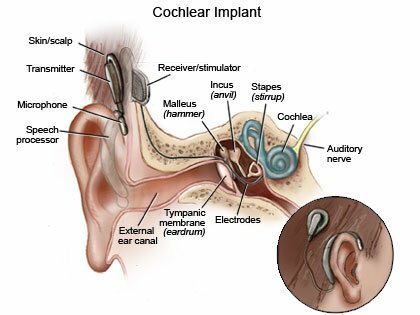 In this way, a cochlear implant amplifies the signal produced by a weakened or damaged cochlea, and normal hearing can be achieved. Cochlear implants can correct for hearing loss in both children and adults, but are especially important for children. Regardless of a child’s hearing status at birth, a child may experience hearing loss at a young age when proper hearing is crucial to learning and development, especially language acquisition and social skills. If you suspect that your child may be suffering from severe hearing loss, or if your child was born with hearing impairment, a cochlear implant may be the right solution. And although hearing aids are an option (due to affordability and discretion), they may not correct for hearing loss the way implants would. The cochlear implant continues working even after its implanted, and within a few weeks after surgery the sound and speech processor should be fully matched up with the receiver and transmitter. The implant will be finely tuned to meet your child’s needs. If you think your child is experiencing hearing loss or are worried that his or her hearing loss may be a sign of something more, call the office of Dr. Darius Kohan at (212) 472-1300 for a free consultation.